Nice casual outfit for a relaxed Saturday. Went to visit a friend in the morning who was in a bad accident at the start of the year. Was pleased she was recovering and looking well. 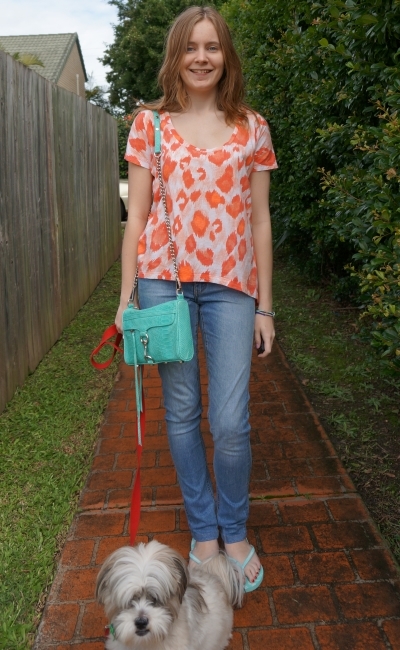 Last worn: leopard print tee, Jeanswest jeans, print thongs, aquamarine mini MAC. A few showers on an otherwise sunny day, so added a scarf to keep warm. However the open toed sandals and a maxi dress were probably not the best ideas - the dress quickly got wet and weighed down with the rain, ended up having to change when I got home. Should just keep this maxi dress for dry days! Last worn: feather print maxi dress, pink sandals, Balenciaga sapphire city. First time I've worn the scarf. Would have never thought of combining turquoise and orange - they look just awesome and fresh together ! ^^ Cute outfits. Lovely outfits, I like the fist top!!! I am determined to get a couple of maxie dresses this summer! I am going to do it! 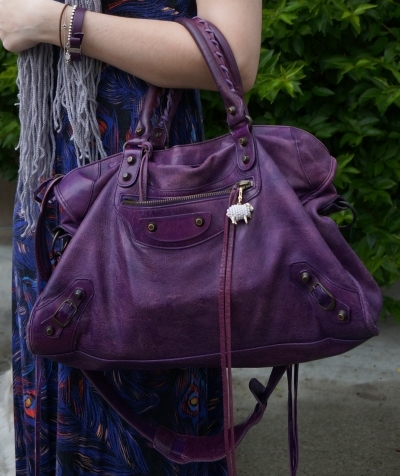 The purple Balenciaga bag is to die for! You look so chic in your errand outfit~ and of course Blue looks as cute as ever!!!! I still haven't gotten my maxi dress for this season yet! The second is an awesome looking one. Lately I'm having a thing for maxi lengths too, so your dress is perfect. Turquoise and orange got my attention, very pretty! you make the PomPon sound so tempting! I wish I could try one on first! You have such an incredible bag collection! I've had that happen to me! A wet dress is not a good feeling :( It looked great on you though Mica! Love that orange and white top above too! Have a great week doll! Cooper kisses! Love that maxi dress! What a cute print. Thank you for the lovely comment on my blog! !Really nice outfit!! I love the maxi dress, such a great print. It's going to be wonderful for spring/summer! That dress is beautiful and I love the color of your blouse. Your puppy is so adorable. I love the blue and orange. They're such great colors on you! I love the leopard tee and the maxi dress Mica! I always stalk your looks for great prints. You find some amazing ones! That purple bag is gorgeous! It looks great with the maxi dress. ps. thanks for visiting my blog! I love the orange leopard print and all of the mint pieces. 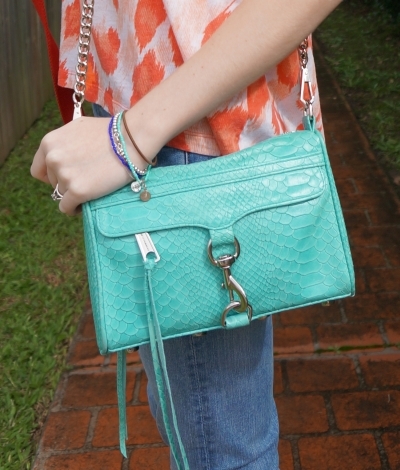 the mint bag and orange top are perfect together! loving the orange and blue together in the first outfit! awww your puppy is so cute :) Love the maxi on you! Aqua and orange always look magnificent together - you look lovely Mica.